Retired July 1, 1953. Died January 1, 1975. Willard Roland Wolfinbarger was born in Marion, Kansas, in 1900. He enlisted in the Army in 1917, and was assigned to Company "M", 139th Infantry of the 35th Division with which he participated in the campaigns of St. Mihiel and Meuse-Argonne. He was honorably discharged in 1919. 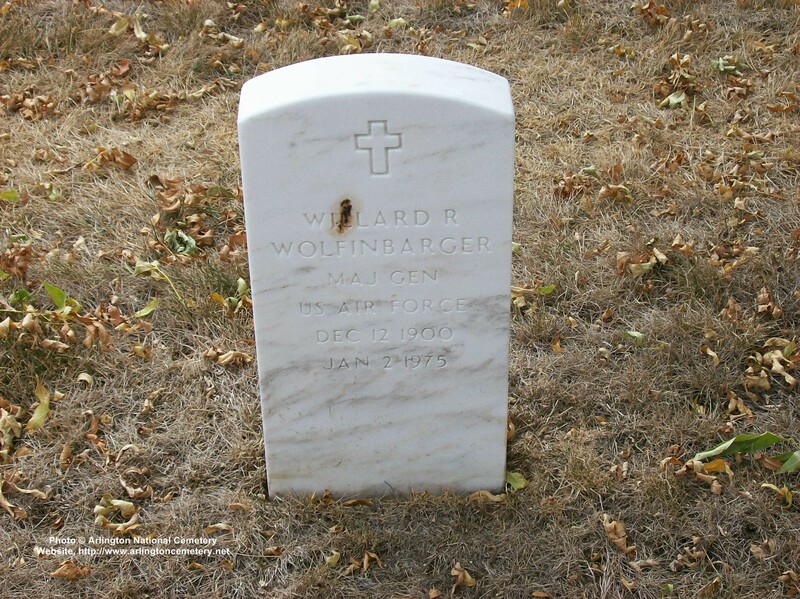 General Wolfinbarger graduated from the University of Kansas with a bachelor of laws degree in 1924. While there, he was a member of the Phi Alpha Delta Upsilon fraternities, and was president of the student body of the School of Law. On March 10, 1924, he was appointed a flying cadet. After receiving training at Brooks and Kelly fields in Texas, he was commissioned a second lieutenant in the Air Reserve March 16, 1925. He received his regular commission as a second lieutenant of Air Corps January. 23, 1927. 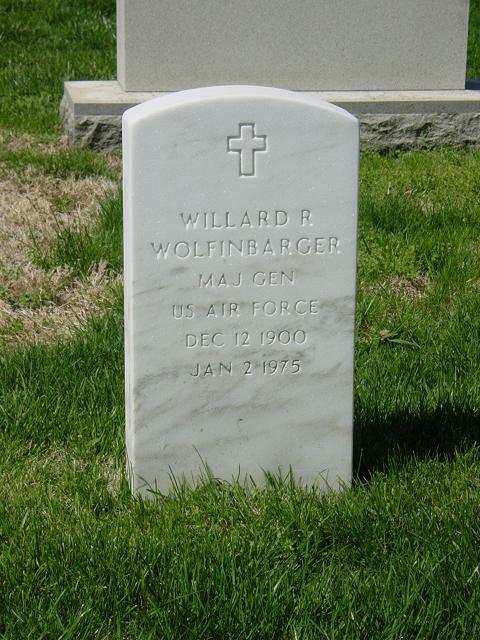 During the early part of his military career, General Wolfinbarger served at various Air Corps Fields in the United States and the Philippine Islands and graduated from the Air Corps Tactical School (1937) and from the Command General Staff School (1938). In the spring of 1940, General Wolfinbarger was appointed at Berlin, Germany. In 1941, he became a staff officer with the Air War Plans Division at Air Corps headquarters in Washington, D.C., and subsequently was named operations and general staff officer with the Air War Plans Division of the War Department General Staff in Washington. While assigned to this duty, he served temporarily in England from June to August 1942. In June 1943, General Wolfinbarger became a member of the Joint War Plans Committee at Air Corps headquarters, and during that month had temporary duty in England. From August to September 1943, he had temporary duty in Quebec, Canada, and from November to December 1943, served temporarily in Egypt, after which he returned to duty with the Joint War Plans Committee. General Wolfinbarger went to the Southwest Pacific theater in March 1944, to become executive officer of the XIII Fighter Command. During the ensuing 14 months he also served at intervals as commander and deputy commander of that command. In June 1945, General Wo1finbarger entered the Army and Navy Staff College, from which he graduated the following December. He then became British Empire Specialist with the Military Intelligence Service of the War Department General Staff, and in April 1946, was named deputy executive to the director of the Military Intelligence Service. He became executive to the director of that service in July 1946. A month later he was appointed an intelligence instructor at the National War College. In August 1948, General Wolfinbarger was appointed chief of the Plans Section of the U.S. Air Forces in Europe, with station at Wiesbaden, Germany. A year later he assumed command of the Tactical Air Division of Continental Air Command at Pope Air Force Base, N.C. On Aug. 1, 1950, he became commander of the Ninth Air Force (Tactical) at Pope Air Force Base and assumed additional duty as chairman of the Air Tactical Support Board in July 1951. The following month he was relieved as commander of the Ninth Air Force, retaining his assignment as chairman of the Joint Air Tactical Support Board. General Wolfinbarger has been awarded the Legion of Merit with oak leaf cluster, the Air Medal, the Army Commendation Ribbon and the Purple Heart. He is rated a command pilot, combat observer and technical observer, and during World War II he flew 23 combat missions, totaling 109 hours. He was promoted to first lieutenant (permanent) November 1, 1932, and to captain (temporary) April 20, 1935. He reverted to his permanent rank of first lieutenant June 16, 1936, and was promoted to captain (permanent) January 23, 1937; to major (temporary) December 30, 1940; to lieutenant colonel (temporary) January 5, 1942; to colonel (temporary) March 1, 1942; to major (permanent) Jan. 23, 1944; to colonel (permanent) April 2, 1943; to brigadier general (temporary) September 11, 1949; to, brigadier general (permanent) August 11, 1950, with date of rank from October 1, 1949; to major general (temporary) August 11, 1950, with date of rank from July 30, 1950.